One of the landmarks of Bathinda, the Hanuman Chowk, will get a new look soon. Biomedical waste poses threat, but who cares! Once a non-descript town in Punjab’s cotton belt, Bathinda tells an incredible story of how the Army went on to convert the sand-dunes into a lush green area. The area had sparse population and greenery confined to typical desert shrubs, when the military station here, one of the largest cantonments in Asia, was established in the early seventies. It was a virgin area spread over 13,000 acres in an arid zone and plagued by chronic water shortage and termite menace. To strengthen the foundation of education in the state, ‘Knowledge Foundation, Punjab’ has been formulated by 20 private educational societies and others. Convocation of B Tech students (batch 2005-06) from Guru Gobind Singh College of Engineering and Technology, Talwandi Sabo, was held at the college campus today. With an intricate design of ‘mehandi’ specially woven on her palms to observe ‘Karva Chauth’, Kuldip Kaur sat with her husband Gurjit Singh behind the iron gates at the Central Jail here this morning discussing the happy moments of the days when they were free birds. Gurjit Singh admires the mehandi pattern on the hands of his wife Kuldip Kaur in the Central Jail at Bathinda on the occasion of Karva Chauth on Monday. — Tribune photo by Kulbir Beera. Baba Jahiri and Kaka Singh, two employees working in a company, have accused the police official in charge of the Civil Lines post of beating them up. They also alleged that the police official had wrongfuly confined them on Sunday night. Members of the Bathinda unit of the Physically Handicapped Association, Punjab, held a meeting at Durga Mandir, Mandi Goniana here yesterday to analyse the government’s attitude towards the handicapped. Employees of the Punjab Roadways Transport Corporation (PRTC) today took out a gate rally at the PRTC workshop in Bathinda to protest against the transport policy of the Punjab government. A labourer, Ghanshayam Pandit, was killed when debris fell upon him. He was digging up the foundation of a house on street number 2, near Ram Bag, here on Sunday. After the investigation, the police registered a case against Gurnam Singh, the owner of the house, on Monday evening. Expressing concern over the increase in terror activities in the country, Harjeet Singh Grewal, the Bharatiya Janata Party (BJP) in charge of Haryana, criticised the Central government’s failure to check such activities here today. The Bar Association of Fazilka demanded a district headquarters status for Fazilka here today. The meeting, which was presided over by Anil Jain, president of the Bar Association, resolved that the request had already been made several times to the Chief Minister. Jalandhar defeated Phagwara to win the Guru Ganesh National Football Tournament played at the Nehru Stadium here on Sunday evening. Pallavi won the “Mrs Karva Chauth” title (picture on the right) during a function organised today in the afternoon by the Bharat Vikas Parishad (BVP) at Arorvansh Dharamshala here today. Beautifully dressed women, most of them in tomato red outfits, participated in one-minute games and other competitions to utilise the time. 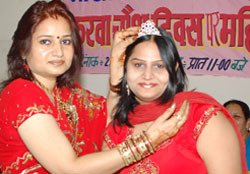 Pinky Bhateja was the chief guest on the occasion. Speeding buses killed three persons in separate accidents. Jagjit Singh (17), a student of class XI of Government Senior Secondary School, was crushed to death by a bus near Panjgrahi village in Faridkot district in the morning today. Police sources said the driver and conductor of the bus fled after the accident. Enraged over the incident, the students of Guru Teg Bahadur Polytechnic College, Rode, and the local people burnt a Punjab roadways bus and pelted stones at another bus. 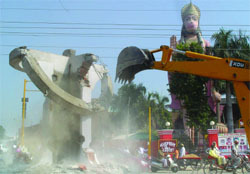 One of the landmarks of Bathinda, the Hanuman Chowk, will get a new look soon. The process of revamping initiated recently aims at structural changes at the roundabout to facilitate smooth traffic in the area. Around Rs 6 lakh would be invested to give the roundabout a facelift. The circular structure in the congested area is being demolished to give way to traffic lights. Traffic jams have become a regular feature at the Chowk, situated beside the two famous schools of Bathinda. The area witnesses traffic snarls in the morning and evening when a large number of vehicles make a beeline to the Chowk for dropping and picking up the children. Further, the varied modes of transport, right from bicycle and cycle-rickshaw, to three-wheelers, cabs and heavy vehicles like buses and trucks, further add to traffic woes. Sometimes, the animal-driven carts also cause a major traffic blockade. The roundabout that was constructed some 15 years ago, appears to have outlived its utility due to the increase in the flow of traffic. In fact, it has become a traffic bottleneck, prone to frequent accidents. The Chowk named as Hanuman Chowk due to the 50-feet tall statue of Lord Hanuman, installed on the premises of a school, is the focal point for the road approaching the main bazaar, railway station, bus stand and the sports stadium. For the cops, the circular structure is posing problems in controlling traffic. In fact, it has become a big hurdle and the space could be utilised for the smooth flow of traffic, says Bhagat Singh, a local resident. Assistant Municipal Corporation Engineer, Ravinder Kumar Singh, said the authorities have decided to demolish the roundabout and replace it with traffic lights for the convenience of the people as the traffic lights will help in reducing traffic congestion. The biomedical waste scattered near the second gate of the Bathinda civil hospital draws the attention of all except for that of the authorities concerned. It appears that the authorities are waiting for an epidemic to break out before some action is taken. The Punjab Pollution Control Board (PPCB) had issued an order to the hospitals and nursing homes that they should collect the waste in coloured bins that are duly covered. The waste was to be disposed of in a hygienic manner. But the order does not seem to have the desired effect as biomedical waste is burnt in the open every morning. Biomedical waste poses a threat to humans and animals alike. The waste comes from healthcare institutions like hospitals, blood banks, research institutes and laboratories. It includes liquid and non-liquid tissues, blood products, body parts, laboratory waste, plasters, used cotton and surgical blades, blood stained clothes and gloves, used injections and needles, among other things. The civil hospital, with a capacity of 100 beds, performs over 40 surgeries a day, as per the information given by a surgeon. The figure is big enough to make out the quantity of biomedical wastage produced daily. Sources in the hospital informed that the authorities there have entered into a contract with a private company in Ludhiana for the treatment and disposal of the waste. Despite the deal, the waste is burnt every morning, which adds to the air pollution. Burning of biomedical waste is injurious to health. It generates harmful gases that can cause respiratory problems. The waste helps in the spread of virus and bacteria that cause many a disease. Despite these hazards, the problem seems to have gone largely unnoticed. Once a non-descript town in Punjab’s cotton belt, Bathinda tells an incredible story of how the Army went on to convert the sand-dunes into a lush green area. The area had sparse population and greenery confined to typical desert shrubs, when the military station here, one of the largest cantonments in Asia, was established in the early seventies. 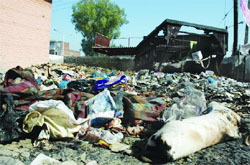 It was a virgin area spread over 13,000 acres in an arid zone and plagued by chronic water shortage and termite menace. The Army accepted the formidable challenge and the rapid change witnessed today is the result of its special stress on arboriculture and landscaping. The frequency and intensity of dust storms, a common phenomenon during the summers, has reduced considerably. The Army chalked out a multi-pronged strategy to expand the green cover, increase fertility of land, manage sanitation and solid waste disposal, control pollution and preserve environment and ecology. A large number of development projects were taken up simultaneously which not only yielded the desired results but also generated employment, ushering in an era of prosperity in the region. The Army also took the lead in developing the area ecologically and commenced the war against the ever-expanding desert. Acute water shortage was a major hurdle in growth. To overcome that, the Army created awareness about rainwater harvesting among the people and exhorted them to use drip irrigation techniques to save every drop of water. Bore wells were dug and canal water was used for irrigation to ensure the survival of plantations. Stress was also laid on water harvesting and conservation of scarce water resources. The beautification of Bathinda had a predictable impact on neighbouring areas as the military station provided quality green cover to this desert city. The cumulative impact of these efforts resulted in the lowering of temperature in Bathinda city and its suburbs. It also helped in providing clean air. Pollution caused by the two thermal power plants was also contained to some extent and the area became rich in flora and fauna. PS Bindra, the man carrying out environmental activities for the Army here. Availability of water has also increased and it is difficult to believe that only 40 years ago, only 1.8 per cent of the region was under degraded forests. Today, the military station rightfully boasts of being host to a large number of birds of different species as more than 70 species of birds, some of which are of rare and exotic varieties, have been identified. Wasteland development and involvement of locals in various development programmes also helped in creating employment avenues for the people. A new era of prosperity has been ushered in and not only Bathinda but the entire Malwa region is looking up to scale new heights of development and prosperity. The credit for this goes to a great extent to the Army which has done a pioneering work and proved that a ‘soldier is always a soldier’, whether it is a battle against the enemy or vagaries of the nature. The Army has brought about socio-economic transformation in the region and played a vital role in the preservation of environment, afforestation, pollution control and creation of awareness on environmental issues, says Brigadier N.P.Sharma, presently posted at the military station. 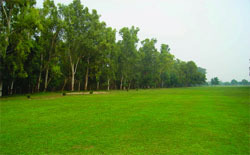 Seeing Bathinda green is like a dream come true. For those who had seen Bathinda in the seventies, the unbelievable change from desert to greenery seems no less than a miracle. Under the plan, educational societies affiliated to the Punjab Technical University, Jalandhar, that are running institutes for technical education across the state, will adopt government-run schools. These schools will be within a 5-kilometer radius of these institutions. Teachers, science labs and transportation facility will also be provided to the schools adopted by these societies. In this regard, a formal letter has already been sent to the Chief Minister. Dr J. S. Dhaliwal, president, Punjab Unaided Technical Institutions Association (PUTIA), who has himself adopted schools in Bathinda (Talwandi Sabo), Moga (Gagra) and Mohal, said, “We want to create a new Punjab, the foundation of which will be laid upon knowledge and education. “The education system here is crumbling and a majority of Punjabi youth are addicted to drugs. Our government schools are in a bad condition and very few students from the rural areas make it to the university. The share of rural people is woefully low at the university level. The rural-urban divide is so pronounced in the state on the education front that it deserves immediate corrective measures,” Dhaliwal said. A study conducted in the year 2005-06 by the Punjabi University has revealed that there were only 4.07 per cent students from the rural areas in various universities of Punjab. Of the 22,360 students enrolled in Punjabi University (Patiala), Panjab University (Chandigarh), Punjab Agricultural University (Ludhiana), Guru Nanak Dev University (Amritsar), and their regional campuses, only 911 were students from rural areas. And a minimal number — 2.20 per cent — is in Panjab University and 8.16 per cent in Punjabi University. Dhaliwal, who is himself running 15 different colleges of technical education in Mohali, Talwandi Sabo (Bathinda) and Moga areas will be adopting schools coming under a 5-kilometer radius of his four societies, namely Guru Gobind Singh Group of Institutes, Talwandi Sabo (5 colleges), Baba Ishar Singh Group of Institutes, Moga (3 colleges), Sahibzada Ajit Singh Group of Institutes, Mohali (2 colleges) and Shaheed Udham Singh Group of Institutes, Mohali (5 colleges). Jagmeet Kaur, secretary, PUTIA, said there had been widespread exclusion of rural students in Punjab from higher education, particularly professional education, in the past two decades. “And this gap has been widening ever since,” he added. Around 120 students from various disciplines like computer science, electronics, mechanical and information technology were awarded these degrees. In the absence of Technical Education Minister, Swarna Ram, who was to award the degrees to the students and couldn’t come due to some personal engagements, the degrees were awarded by Dr V. K. Arora, Dean (Academics), Punjab Technical University, Jalandhar, along with Dr J. S. Dhaliwal, chairman, Balaji Educational Trust, which runs this college. Medals and prizes to winners of different branches of B Tech degree were awarded by Dr P K Bansal, principal, Malout Institute of Management and Technology. Guru Gobind Singh College of Engineering and Technology, Talwandi Sabo, has more than 1000 students and offers degree courses in computer science, electronics, mechanical and information technology. Gurjit keenly admired the pattern on his wife’s hands and whispered something in her ears. Thereafter, both broke into laughter. They are undergoing 20 years imprisonment in a murder case. It was a special day for Kuldip Kaur and 20 other inmate couples who were allowed to meet for three hours from 9 am to 11 am in the prison on the occasion of ‘Karva Chauth’ today. Donning a bridal pink suit, she wore artificial jewellery and bangles that the inmate women were specially allowed on the festival. Gurjit and Kuldip Kaur of Rampura were married four years ago and were put behind the bars a year later in connection with the murder of his sister-in-law. Jaswant Singh and his wife Raj Kaur were lost in thoughts as they watched Gurjit and Kuldip Kaur taking things lightly. The two, who are residents of Ferozepur, are undergoing trial in a murder case. A family of five, Charan Dass and his wife Sudesh Rani and their son Ravi Jain and his spouse Khushbu also celebrated ‘Karva Chauth’ in the jail along with their other son Kavi who has been sent to judicial custody on the charges of the dowry death of Kavi’s wife Neelam on August 20. Jail superintendent L.S. Jakhar said emphasis was being laid on moral and physical education. Yoga classes were being held and a de-addiction camp will be held next month. “The driving licence of Kaka Singh, Rs 9,000 in cash and a mobile phone bearing the number 9888315623 is in the possession of the sub-inspector. After our repeated requests, he let us off in the morning,” he added. Factory raided: The Chaoke police arrested two persons from a factory used for manufacturing drugs in village Ballo. Jagsir Singh of Bhikhi and Kala Singh of Samao Bhikhi villages were arrested on the spot, while the owner of the factory managed to escape. Dreams do come true if you have enough nerve! A 22-year-old young man who hails from a very poor family has proved this. Today, a known singer of Punjab, Masha Ali is the son of a daily wage labourer at Talwandi Sabo. As we say, time changes everything, and so, it has rightly changed. Every Punjabi knows him as winner of reality show ‘Awaaz Punjab Di-2’ (APD 2). A student of final year Bachelor of Arts at Government Rajindra College, Bathinda, ‘apna’’ Masha Ali as he is known in Bathinda is expected to reign on the world of Punjabi pop very soon. He already has a successful month long tour of UK to his credit and his pop album is expected to hit the market somewhere around mid of November this year. Due to the family’s poor financial condition, Masha thought of leaving his studies many times. ``But every time I thought of doing so, my friends and teachers became my backbone and supported me, financially and emotionally,’’ Masha informed with sobbed eyes. Masha Ali Khan was born in 1985 in the family of small time folk singers in the dusty hamlet called Natt Banger, some 30 kilometer from Bathinda. ``I can never forget my college days when I used to perform as playback singer with bhangra teams to earn some extra bucks. Now that I have started earning more money by doing live shows, I want my father should lead an easy life. He has worked all his life and now its my turn to give him all the happiness in this world,’’ Masha tells. He recently built a new house for his parents from his earnings. “I want to build a grand villa for my family and want to repay all the debts that my father ever took.” An ardent fan of Lata Mangeshkar, Sonu Nigam, Sukhwinder, Sardool Sikandar, Saleem and Feroze Khan, Masha is all set to rule Punjabi pop with his new album. Alleging that the PRTC management has adopted an indifferent attitude towards them, the president of the PRTC Employees Union, Preetam Singh said they would stage a dharna on October 30, in front of the department’s head office in Patiala. He alleged that the management was benefiting private transport companies. Even in the time-table, private companies were being given more preference, he charged. Singh rued that the PRTC employees had not been provided with uniforms for the last four years and no payment for overtime had been given in the past three years. Criticising the government’s move on contract recruitments, he said daily wagers working for the department for the past twenty-five years had not been regularised. The revised salaries as per the recommendations of the Pay Commission in 1996 had also not been implemented, the PRTC union leader added. 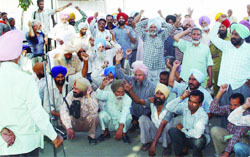 The labourers gathered at the civil hospital today, said, “When we reached the spot Gurnam Singh refused to allow us to rescue him. Only late at night could we bring him out.” A case has been registered against Gurnam. He said India is becoming a centre for terrorist activities as 156 districts in 13 states of the country are facing either naxalite movement or terror related activities. After 2004, till date, 3,674 such incidents had taken place in the country leading to the loss of lives of thousands, he claimed. Grewal was here to visit his native place Dhanula about 10 km from here. Addressing a press conference, he refuted the charges that the Gujarat riots were state-sponsored. He termed it as a propaganda initiated by the Congress. However, he alleged that Congress leaders were responsible for the 1984 riots but were still enjoying senior positions within the party. Grewal said the US Congress has passed a special resolution for curbing terrorism there but the present UPA government was not making any attempt to control the menace. He also admitted that the common man cannot afford the hike in power tariff in Punjab. Decline in the average production of cotton has become a cause of worry for the farmers in Mansa region. The crop has witnessed a steep decline of 25 to 30 per cent due to Mealy bug. Farmers said that even after repeated spray of pesticides, they were unable to achieve their targets as the Mealy bug had attacked the crop at the time of sowing. The Bar Association took a serious note of the announcement made by the Chief Minister regarding the creation of Khanna district and the appointment of ADC there, on the death anniversary of Basant Singh Khalsa, former minister and Member of Parliament. The members of the Bar Association also decided to remain absent from the revenue courts till November 2, and send their memorandum to the government. Surjit Kumar Jyani, MLA, Fazilka has also supported the demand, but no positive response has been received so far from the government, the Association lamented. The meeting also decided to meet the other BJP leaders of Punjab to prevail upon the government. Chief guest Sunil Jakhar said there could be no better tribute to NDS Partap Singh and Ganesh Vohra than organising a tournament in their memory. He said NDS Partap Singh and Ganesh Vohra had made great efforts to promote soccer and baseball in the region. Rajinder Girdhar, principal of the Homeopathic Medical College and Jaspinder Singh Jakhar, the district president of the Football Association, hailed the organisers for reviving interest in game in the region. Kulbir Singh Kang, executive magistrate and state president of the Archery Association, has organised such events earlier too. Around 13 teams from Punjab, Haryana, Rajasthan and Jharkhand participated in the five-day tournament. She lauded the efforts of the BVP in celebrating traditional festivals with gaiety, vigour and pure Indian flavour. Priya Dahuja and Alka Chhabra were the anchors for the show.